We roll into the weekend with a new review for a recently released Nintendo Switch eShop game, Assault Android Cactus+. If you like twin-stick shooters and high-scoring frenzies, this game is for you. See why with the SuperPhillip Central review. Do androids dream of getting high scores on leaderboards? Originally released in 2015 on PC, indie developer Witch Beam's Assault Android Cactus eventually made it to home consoles--specifically the PlayStation 4 and Xbox One in 2016 and 2017 respectively. PlayStation Vita and Wii U versions were planned and in development, but those didn't pan out. The cancellation was especially painful for one particular group of gaming fans, as out of the big three console ecosystems, Nintendo players were left out from the game's release. That is, until now, with Assault Android Cactus+ on the Nintendo Switch. An enhanced port of the original 2015 game, Witch Beam brings their critically acclaimed twin-stick shooter to the Switch with more content and the promising pictures of portable play to be excited about. 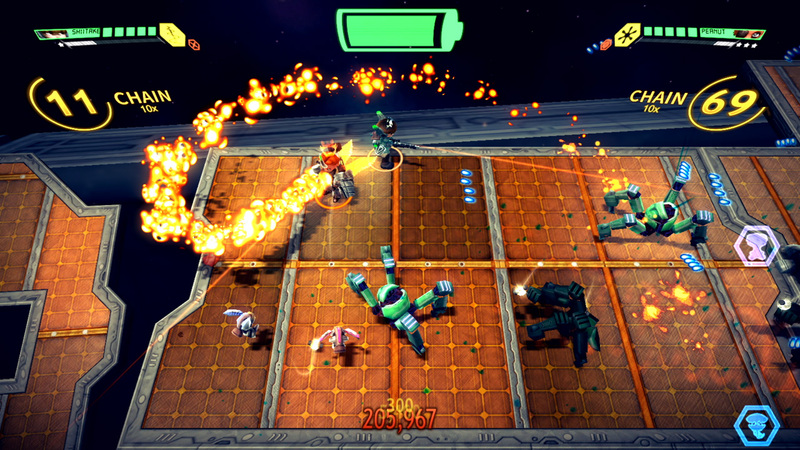 Assault Android Cactus+ brings with it top-down perspective, twin-stick shooting action spanning 25 individual levels in its main campaign. The goal of each level is to eliminate all enemies within each arena, which is no easy task when you have squadrons of robotic foes homing in on your position, surrounding and attacking. Fortunately, one of the nine android playable characters available to you (one unlocks per five levels in the campaign completed) has unlimited lives. Once their health meter depletes, it's just a matter of mashing on the fire button to rejuvenate them and get them back in action. Of course, perishing in battle results in a lower rank due to a point penalty for each time you fall in battle. 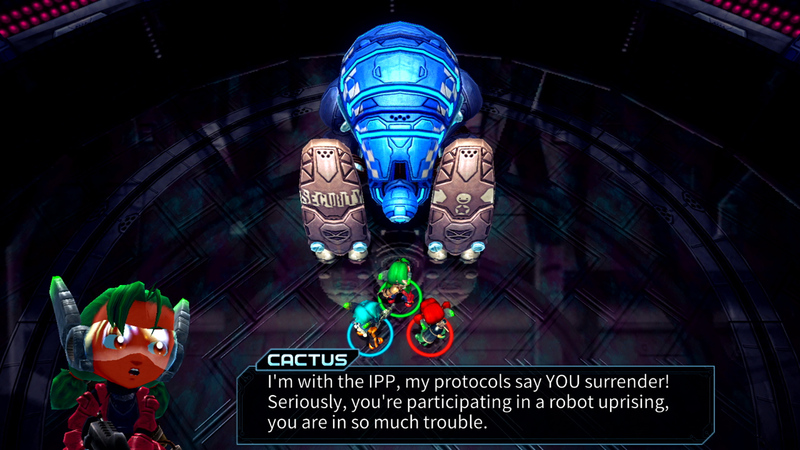 While this assault android is outnumbered, with her high-powered offense, the odds are on Cactus's side. The primary cause for concern, however, is that androids use up a lot of energy and juice in these high-powered, high-octane skirmishes. They need batteries to recharge themselves, which drop from defeated enemies. If the battery meter fully depletes, it's game over. When you have battlefields full of frenzied foes frantically firing shots and making attacks at you, it can be difficult to get to a battery in time. It's a balance of eliminating enemies and keeping tabs on your battery gauge in order to save yourself from a ruined run. Levels in Assault Android Cactus+ transform and evolve as you do battle on them. Static floors turn into running treadmills, walls and barriers rise up and alter the structure of the level, and platforms can appear from the arena sides to expand the size of the battlefield--or in some cases, give you less ground to work with. The bigger they are... the more bullets they take! 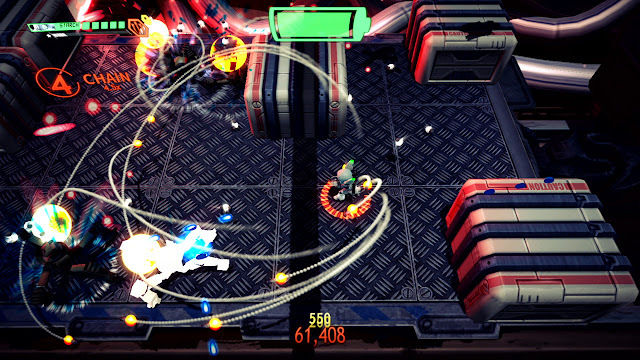 While fighting off the robotic horde of enemies, there are various power-ups that drop from defeated foes. Things like increased firepower that temporarily adds two support drones to stand by your android's side to level enemies into scrap, as well as power-ups like upgraded speed and mobility, and a power-up that short circuits foes for a limited amount of time, allowing your android to pick them off as they're offline--these all give a great advantage in battle. Losing all of your health means you lose these power-ups immediately rather than after they run their course naturally, so it's important to be smart about when you pick up a power-up so you don't die in battle quickly and waste it. 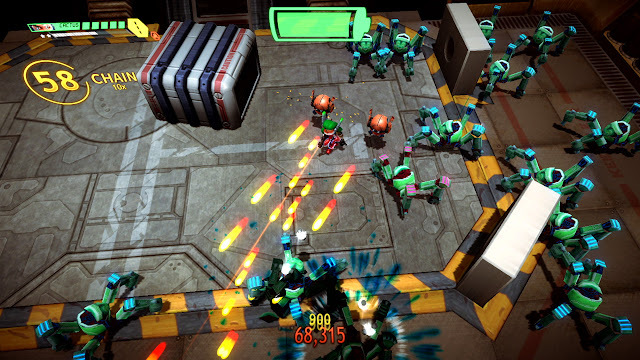 Each of the nine playable androids in Assault Android Cactus+ has a main weapon and a special weapon that usually serves as a great means of crowd control and delivering extra damage to enemies with higher health to them. Our primary android protagonist, Cactus, fires a straight series of shots forward, while her secondary weapon is a flamethrower, fantastic for getting all up close and personal to take out encroaching enemies. Other androids use guns that fire off a spreading shot of bullets, deliver shotgun blasts, and utilize rail gun properties. The stronger the weapon, the more time it takes for it to cool down before you can use it again. The special weapons like firing off cannonballs and Cactus' aforementioned flamethrower take longer to cool off before they can be used once more. Additionally, the special weapon trigger doubly serves as an evade button to give a much needed line of defense for your chosen android. Not mentioned in the body of this review, but there is co-operative play for up to four players locally. Each area of the Assault Android Cactus+ campaign is comprised of four standard levels of eliminating all enemies and one final boss fight. These greatly add some freshness to what I consider otherwise rather repetitive gameplay. The boss battles are a nice change of pace from going through the motions of running and gunning through wave after wave of similar looking enemies. The bosses are truly challenging, and they afford little room for error. I felt decently challenged by them, and one was a roadblock for me for about a day before I finally overcame them. receives their own special dialog to bookend each battle. Every level in Assault Android Cactus+ utilizes a leaderboard that compares your scores not just with your Switch friends, but it also compares your scores with the entire Assault Android Cactus+ user base. It's incredibly rewarding to improve your own personal scores and letter grade ranks while gaining motivation to best your friends and reach higher and higher on a given level's leaderboard. Leaderboards are also available for the endurance mode, where you face wave after wave of enemies, as well as the daily challenge mode. Unlockable Campaign+ and Boss Rush modes make themselves available to you upon completion of the base campaign. You also earn credits when completing levels, which can be used to purchase bonus content like concept art, promo art, and even cool features like a first-person perspective to play around with in game. Assault Android Cactus+ contains enough content to it, fast-paced, wild and hectic arenas to blast away baddies in all the while gunning for high scores, and a stellar presentation to make for a game that one will find hard to not keep coming back for more. While best played in short bursts, as the gameplay does get a tad repetitive a bit after a short while, Assault Android Cactus+ makes its mark on the Nintendo Switch as another fantastic indie title in the system's rich catalog of games. Lock and load, and let loose on your targets with Assault Android Cactus+. Just don't forget to recharge that battery! A review code was provided for this game.